The Chinese government is getting nervous about the numbers and is insisting, top-down, on obtaining economic growth of 6.5% to 7% this year, one way or the other. China’s cabinet has sent inspectors fanning out to provinces across the country to “keep economic growth within a reasonable range and ensure the main objectives and tasks of this year’s economic and social development will be completed,” according to Xinhua news agency, cited by Reuters. Because, apparently not all of China was playing along…. Some regions and government departments are not coordinating their policies well and some officials are lazy in their work, Xinhua said. These inspectors, in addition to keeping up the pressure on growth, are also supposed to make sure that major policy measures are implemented along with “supply-side structural reforms” – cutting, for example, the massive and destructive overcapacity in the steel and coal sectors and the power generation sector. And these inspectors also supposed to support investment projects and innovations. The government must have taking a good look at the rail freight data and is getting desperate, and it’s going to force official growth to happen, because the rail freight data, one of the key gauges of the goods producing economy, is dismal and contradicts the official growth story. The National Development and Reform Commission (NDRC) said Monday that rail freight volume in July dropped 5.8% from a year ago, to 263 million tons of cargo. For the first seven months, rail freight volume plunged 7.3% year-over-year. But 2015 was already a terrible year. 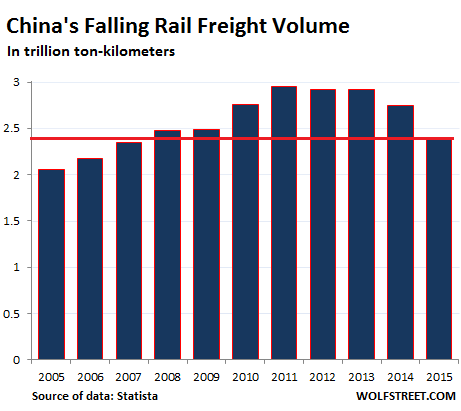 Note how freight volume plateaued in 2011, 2012, and 2013 before entering the decline phase. With 2015 freight volume down nearly to the level of 2007, freight volume for 2016 is shaping up to be considerably lower still – and has a chance of setting a decade low. That doesn’t speak of growth in the goods-producing sector, or even of stagnation. That speaks of an ongoing sharp multi-year decline with hues of depression in certain areas of the goods-producing economy. While some areas of the goods-producing economy are still growing, such as the production of autos and automotive components, with heavily incentivized auto sales likely to hit another record this year, other areas are in a steep decline, exports are weak, the construction sector is wobbling…. These losses in the goods-producing economy are now to be overcome by gains in the service sector as part of the great transition, and the service sector is growing, but it’s going to have to hustle to get even close. So maybe it’s just easier for all these local officials who submit economic growth numbers to the central government to do a little fudging.